Ambi Design-The Blog: Today's article in the Examiner is worth taking the time to read!! Today's article in the Examiner is worth taking the time to read!! 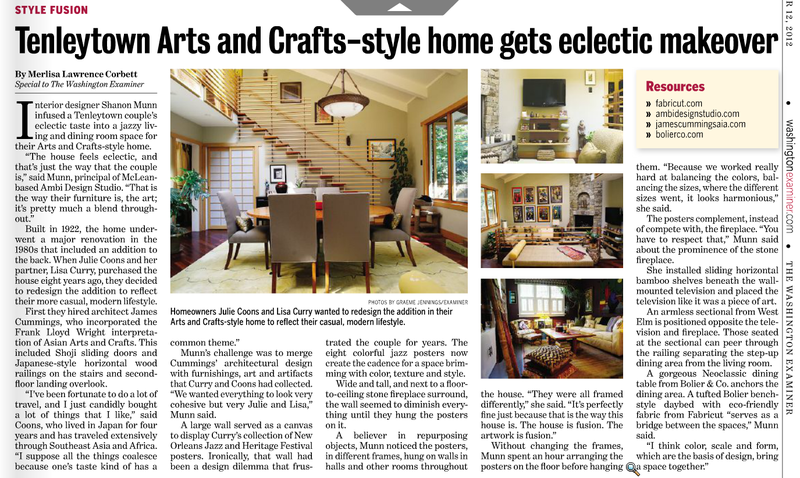 Today's Examiner is featuring a home I worked on two years ago. Julie and Lisa brought eclectic tastes and personalities to the project and I wanted it to reflect in their home. They had a collection of family antiques and pieces from their travels but nothing gelled together. The most challenging part of the project was trying to improve the visual and functional flow between the sunken family room and the dining room above. The daybed achieved that goal, keeping the railing area visually free, but allowing interaction between the areas. Another challenge was combining the focal points (TV with the fireplace) and the intimidating height of the adjacent wall.